Reegan Kabaria Mungi is a small, intense, unassuming, and extremely polite man. He has a degree in Social Work and Community Development as well as an MBA. He possesses a contagious smile and an aura of quiet confidence that immediately inspires your trust. 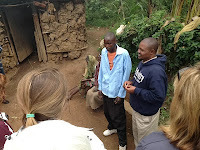 Reegan is the Kenya Director of the ZOE Orphan Empowerment Project. He left another aid organization to join ZOE and took a significant pay cut in order to do so. When I inquired why he would work so hard for less money (not very “American” after all) he told me that the other organization saved one child at a time, which was very commendable, but that the ZOE Orphan Empowerment Project saved entire villages of orphans. He explained that he went from making a difference in the lives of dozens of children to changing the destinies of thousands of them. By providing empowerment opportunity to the young heads of orphan households, they assist entire families, not just one at a time. What ZOE does is challenge, not charity; provide incentives, not insults; and invests in their future, not take away their dignity. Challenge, not charity. When they gather the orphans into community based working groups, the orphans are challenged to operate similar to an extended family. They are charged with taking care of each other. It is made clear to them that ZOE will give them nothing that they can provide for themselves. This is not charity, this is empowerment. This is not an American organization coming in with a checkbook making handouts, but local people partnering with some others from around the world who care enough to give you a chance to make a life and a living for yourself. The first days of the three-year process are hard because some of the children are sick, or suffering from malnutrition, or have been taken advantage of by unscrupulous neighbors or relatives. It would be so easy to solve their problems for them, but this would take away their dignity and foster dependency. Instead, the initial days of their participation insures that emergent medical needs are taken care of and that they work together, as a group, to become food stable. Certainly they do not have “enough” by American standards, but they are no longer at risk of starvation. The focus on intentional discipleship and group formation, set standards of behavior for the group members, and begin to dream about a better future. Incentives not insults. “Why not just give them mosquito nets?” one of our visiting team asked. Reegan went on to explain that nets and blankets were given as an incentive for the orphans to begin practicing habits that would promote personal cleanliness and environmental health. Some of these young people’s parents died before they learned the importance of removing standing water from around their homes and keeping their area clean. ZOE empowers them to take charge of their life and to take pride in their personal hygiene and their daily habits that will provide a healthly living environment for themselves and their younger siblings. Once they prove that they are willing to abide by the standards that the working group sets in partnership with ZOE, blankets and mosquito nets are provided for all the people in the household. These are earned incentives, not gifts given out of pity that may be seen as an insult to their fragile sense of being. Receiving reward for accomplishment serves to motivate the orphans to work harder to seize their God-shaped dreams and pursue God's best for their lives. Invest in the future, not take away dignity. So how do the orphans move from dependency to being independent? They set goals for their lives, learn to dream of a better tomorrow, and then they write business plans that show their working group that they are ready to begin a new endeavor. Once the working group accepts the plan, they receive training, often by other orphans who have already started a business, in best practices related to their chosen vocation. Perhaps they will learn tailoring, or shop keeping, or hairstyling. When they are ready to begin their business, they return to the working group and ask for a “start-up kit” which will provide them the initial capital to begin their business. This kit, very modest by American standards valued at just a few hundred dollars, may be the first real investment these young people have ever had made into their lives. It might include a foot-pump sewing machine, thread and fabric for a few garments, or enough money to purchase inventory for a small vegetable stand. The recipients feel extremely responsible for the investment and their entire working group holds them accountable for their results. They meet weekly to report to the group their progress. Before long, often within the first year, children who were once seen as blight upon the village, become prominent citizens of the community. Pain is turned into pride and the investment creates a future for them when previously they could barely make it through today.